It has been eight years since Batman vanished into the night, turning, in that instant, from hero to fugitive. Assuming the blame for the death of D.A. Harvey Dent, the Dark Knight sacrificed everything for what he and Commissioner Gordon both hoped was the greater good. The audio is great all the way around with good bass depth and sound effects coming out of the surround sound. Besides the mixing on Tom Hardys Vocals it gets an almost perfect score with it not being 7.1. The film brings a great score as well the fills the room with sound. Back to Tom Hardys ( Bane) Vocal mixing. His voice is almost 2x louder than every one elses and find that kind of annoying. But the score helps the movie out a lot as for sound. The film shows off great detail, good dark’s and vibrant colors when they enter the screen as most scenes are dark. But the film doesn’t and as with most live action films compare to animated films like Finding Nemo. Through out the film on the Blu-Ray format the Video Aspect changes from 1.78:1 (fills the whole screen as its shot in Imax) to 2.40:1 (widescreen) and is kind of annoying, I think. As you Can see the DVD is cropped due to the Video aspect. The Blu-Ray Blows the DVD version out of the water in PQ as Details are a lot more noticeable like the pimples on Banes neck….you cant see them in the DVD Version haha. 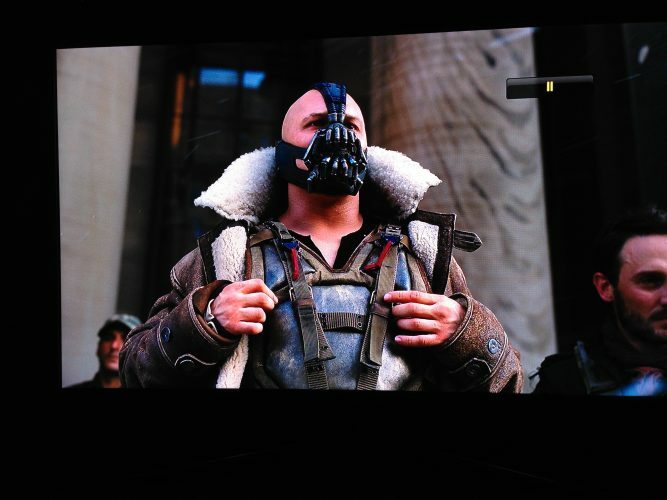 The Straps on Banes vest give the most comparisons as The DVD you cant see the details on the straps at all. The dark Knight Rises is a Great film but not as good as The Dark Knight. TDKR is filled with good action great story lines but is filled with Plot Holes, bad mixing on Tom Hardy’s Voice, and only and maybe only a 1/4 of the run time of the film you get to see batman. Other then the bad the film is a good watch. Its dark, gritty, heart pounding thanks to the soundtrack, and it has heart. 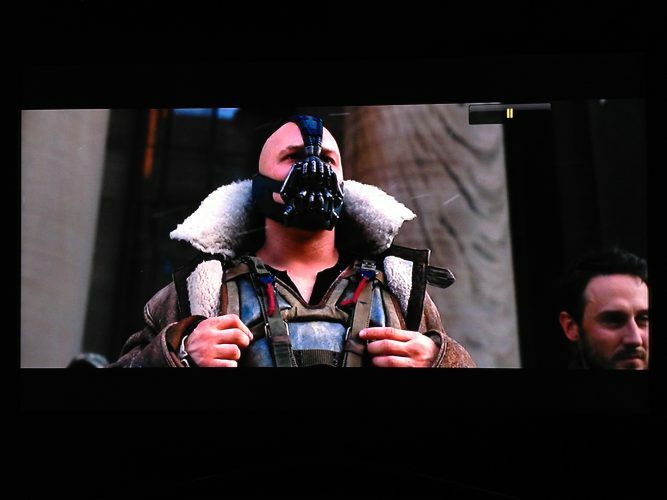 Bane is cool, some hate his accent but Tom Hardy was a beast in this and I loved it. The film also has a twist and a turn but that’s when the Plot exposes its holes and I must say this is the first movie I ever watched where I had to think.. wait a minute. With the good and the bad TDKR is a great film to watch and even own but I must tell you, You need to plan out when you want to watch it as its 2 hours and 40 minutes long. So get some popcorn turn out the lights ( You need to do this as a lot of scenes are dark) and have fun.